The two neighboring sister-states of ancient Mesopotamia competed for dominance and as such grew widely different in character. Assyria took its name from the town of Ashur, which was the main town but it may also apply to the wide empire that was captured and ruled by the Assyrians. Assyria had better climate than Babylonia owing to the fact that it was located in a highland region north of Babylonia. Assyrians were not entirely Semitic and their true origin is not really known. Their culture was also largely indebted to the Babylonians, the Hurrians and the Hittites. Their religion was an adoption from the Babylonians except that the presiding god of the city of Ashur became Assyria’s chief deity. Their nature of worship was animistic. Babylonia was located at the eastern end of the fertile crescent of west Asia with its capitol as Babylon. At times it was referred to as the land of the Chaldeans. There were originally two political divisions namely Sumer and Akkad. Both the Assyrians and Babylonians made use of the Cuneiform script and all people including royalty, priests, merchants and teachers relied on writing. Nebuchadnezzar ruled Babylon for many years, his reign eventually becoming one of the longest and most accomplished in human history. Some historical moments during his reign include twice capturing Jerusalem and destroying it and the buildings and walls he built in the city, which were admired by Greek historians. While merchants and agriculturalists sprung up in Babylonia, Assyrians became more militaristic, forming an organized military camp ruled over by an autocratic king as the supreme ruler. Successful generals then founded Assyrian dynasties and the king was the autocratic general of an army, who was in the early days surrounded by feudal nobility. These nobles were aided, from the reign of Tiglath-Pileser onwards, by an elaborate bureaucracy. The king’s palace was more sumptuous than the worship houses (temples) of the gods from which it was separate. All people were soldiers or little else to the extent that even the sailor belonged to the state. This resulted to the sudden collapse of the Assyrian during the age of Ashurbanipal when it was drained of its warrior population. In the neighboring Babylonia, the priesthood was the highest authority with priests having been raised to the throne by the revolution. Under the control of a powerful hierarchy, the Babylonian king remained a priest to the end. 1. Assyria was located north of Babylonia, its highland location giving it better climate than Babylonia. 2. 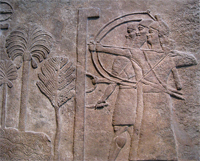 Assyrians formed a military dynasty whereas Babylonians became merchants and agriculturalists. 3. The supreme ruler in Assyria was an autocratic king while in Babylonia, priesthood was the highest authority. 4. Assyrians’ nature of worship was animistic and that of idolatry while for Babylonians it was in a Supreme God. Kivumbi. "Difference Between Assyrian and Babylonian." DifferenceBetween.net. February 20, 2011 < http://www.differencebetween.net/miscellaneous/difference-between-assyrian-and-babylonian/ >. Some of these differences are a bit overblown. For example, we know of the early Assyrians as great merchants whose trade helped the early Hittites develop culturally, during the Old Assyrian period (the pre-dynastic Hittite period, around 2000 BC). Perhaps this could have been expanded a little bit in the paper. This essay written by the young student is far fron accurate. Readings must be read, and teachings must be taught. Why is there no similarity? I loved this article! It helped so much!!!!! and HI! too many incorrect information in this read. Babylon was never known nor referred as the land of the Chaldeans. The word Chaldean came from the split of the two major churches back in in the early 1400’s. It was given from Roman Catholic Church when recruiting the people to follow and leave the Assyrian Church of the East. At that time known as the Church of the East. During the rule of King Ashurbanipal took down Babylon, he placed Shamash-shum-ukin his brother to rule it. His brother later turned his back and tried to separate and it went downhill from that point on. I’m don’t know where you are learning your history but I am pretty sure the Chaldeans have been around MUCH earlier than you have described. The Chaldeans of Ur are mentioned during the time of Abraham. The Chaldean Empire was the Neo-Babylonian Empire which began in 626BC and ended in 539BC. wanted some revelation now I’m confused! Truth be told. Who did God use to destroy Babylon? Who destroyed the Babylonians? Secular and Bible scripture point to the same aggressors…Medo-Persia. shortly after the took Babylon in one night with only the Palace guards in the city, the Persians turned on their former Ally, the Medes. Some refer to this dynasty as the Carthinagins. They eventually attacked and defeated the Greeks of which the likes of Alexander there great came. He did never had any desire to conquer to the west as it was of little value but had an old grudge with the Persians via his father king of Macedonia. Alexander conquored the entire known world EAST of Greece but when he died at age 32, his generals divided up the land and the wars between groupings continued even to this day.